If you’re at INTRUST Bank Arena in downtown Wichita for an event, concert or a sporting event like the 2018 first and second rounds of the NCAA Men&apos;s Basketball Championship, you’ll be spending some time inside the building. 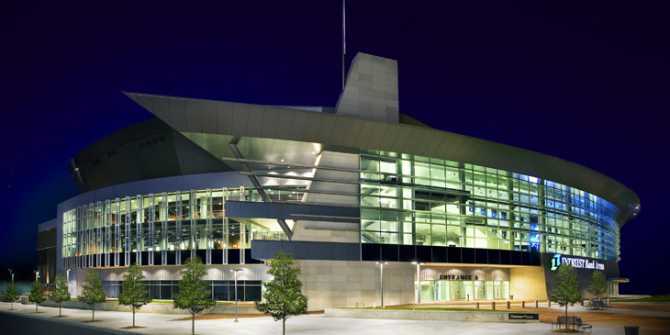 Here are highlights of what to see and do while inside Wichita’s 15,000-seat arena, a state-of-the-art venue that opened in 2010 and is one of 200 arenas managed by SMG. There will be more than 16 concessions stands available with food options ranging from pizza, chicken, barbecue, Mexican, burgers, hot dogs, sandwiches and salads to sweet treats. Some of our favorites: Coop’s Chicken Kitchen offers chicken tenders, sandwiches, fries and frozen treats while The Pizza Joint sells whole pies or ’za by the slice. Wild Leaf is your place for salads, wraps and fresh options, and an outpost of the national Qdoba chain serves up burritos, bowls and chips with salsa or queso. Don’t miss Sideshow Snacks for traditional items like popcorn, pretzels, corndogs, tater tots, funnel cakes and other deep-fried delicacies. Even if you’re eating light or you have a dietary restriction, you’ll find concessions with vegetarian and gluten-free menu items. Choose hummus or a fruit and cheese tray, or get a burger or chicken sandwich without the bun. At most INTRUST Bank Arena events, beer and liquor are available for purchase by patrons 21 years of age and older. Please note that the NCAA prohibits sales of be er and liquor at its championship events, though the bars will be open selling non-alcoholic beverages and food. Whether you’re drinking or not, don’t miss walking through the Guitar Bar to see the collection of autographed guitars and instruments, most from performers who have graced the arena’s stage. You’ll see guitars from Garth Brooks, Taylor Swift, Red Hot Chili Peppers, Twenty One Pilots, Eric Church and others. 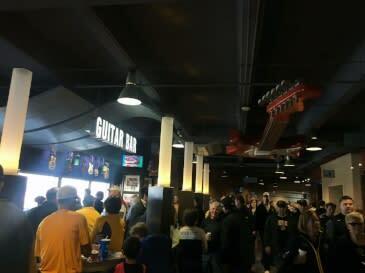 In addition to the Guitar Bar, there are: Budweiser Brew Pub and Grill, with table seating and a unique event viewing experience; Brewhaus Bros., a craft beer bar that boasts 14 taps of local and regional brews; Cox Lounge, a bar and lounge for premium seating guests with restaurant style table service and a private bar; and Fusion Fifty Four, a premium bar for suite owners and guests that serves specialty infused cocktails. 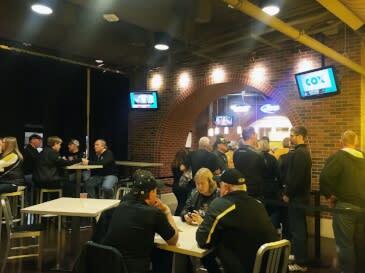 Most events at INTRUST Bank Arena also feature merchandise booths set up in the concourse area. For the NCAA Championship, there will be team-specific merchandise as well as NCAA items for sale. Also during the NCAA Championship, televisions throughout the arena will be tuned to other NCAA Championship games. That includes TVs at the Guitar Bar, Cox Lounge and Budweiser BrewPub. 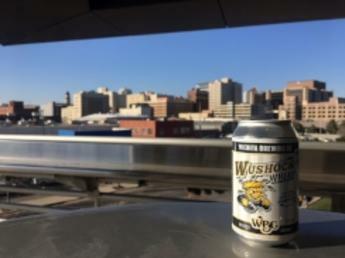 As you’re walking around the main concourse, don’t miss the outdoor deck (no smoking permitted) that offers a great view of downtown Wichita.